A local anesthetic will be given. A sheet of non latex rubber called the "rubber dam" will be placed around the tooth to isolate it, hence keeping it clean and dry during treatment. 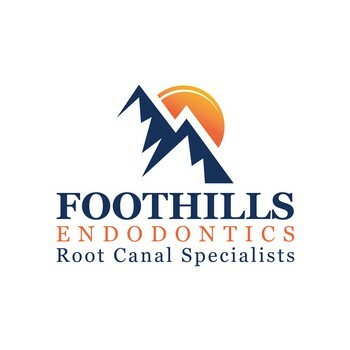 The treatment consists of three or four basic steps, but the number of visits will depend on your particular case. Some treatments take 2 visits but many are just a single visit. In any case, it depends on the degree of infection/inflammation and degree of treatment difficulty. To us, it's more important to do it the very best we can then to meet a specific time criteria. 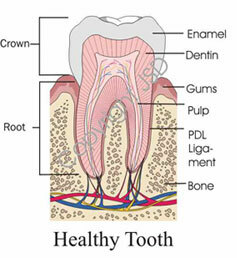 The first step is accessing the pulp by making a small opening in the biting surface of the tooth. Next the contents of the nerve tunnels are cleaned out. The contents could be nerve tissue, necrotic tissue, and bacteria. Finally a rubber filling material called gutta percha is placed inside the tunnels to seal them. 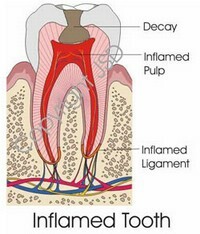 A temporary filling is place in the opening in the biting surface of the tooth.